this is a wall shelf carved on wood in ' black forest ' style. 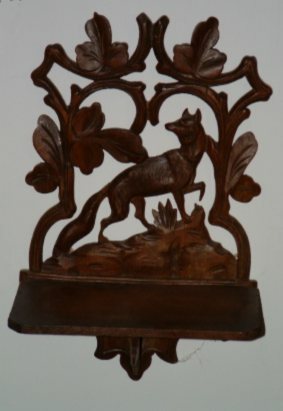 The shelf is carved in the shape of a fox within an arch of trees and leaves. It was made probably in Germany in the first half of 20th century. The wall shelf is 14 in. high (cm. 35) and was bought from an Italian dealer at an Antique Fair.